For other uses, see Free fall (disambiguation). "Freeflight" redirects here. For the album by Ahmad Jamal, see Freeflight (album). 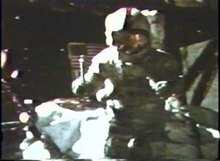 Commander David Scott conducting an experiment during the Apollo 15 moon landing. In Newtonian physics, free fall is any motion of a body where gravity is the only force acting upon it. In the context of general relativity, where gravitation is reduced to a space-time curvature, a body in free fall has no force acting on it. An object in the technical sense of the term "free fall" may not necessarily be falling down in the usual sense of the term. An object moving upwards would not normally be considered to be falling, but if it is subject to the force of gravity only, it is said to be in free fall. The moon is thus in free fall. In a roughly uniform gravitational field, in the absence of any other forces, gravitation acts on each part of the body roughly equally, which results in the sensation of weightlessness, a condition that also occurs when the gravitational field is weak (such as when far away from any source of gravity). In the Western world prior to the 16th century, it was generally assumed that the speed of a falling body would be proportional to its weight—that is, a 10 kg object was expected to fall ten times faster than an otherwise identical 1 kg object through the same medium. The ancient Greek philosopher Aristotle (384–322 BC) discussed falling objects in Physics (Book VII) which was perhaps the first book on mechanics (see Aristotelian physics). The Italian scientist Galileo Galilei (1564–1642) subjected the Aristotelian theories to experimentation and careful observation. He then combined the results of these experiments with mathematical analysis in an unprecedented way. According to a tale that may be apocryphal, in 1589–92 Galileo dropped two objects of unequal mass from the Leaning Tower of Pisa. Given the speed at which such a fall would occur, it is doubtful that Galileo could have extracted much information from this experiment. Most of his observations of falling bodies were really of bodies rolling down ramps. This slowed things down enough to the point where he was able to measure the time intervals with water clocks and his own pulse (stopwatches having not yet been invented). This he repeated "a full hundred times" until he had achieved "an accuracy such that the deviation between two observations never exceeded one-tenth of a pulse beat." In 1589–92, Galileo wrote De Motu Antiquiora, an unpublished manuscript on the motion of falling bodies. A spacecraft (in space) with propulsion off (e.g. in a continuous orbit, or on a suborbital trajectory (ballistics) going up for some minutes, and then down). An object dropped at the top of a drop tube. An object thrown upward or a person jumping off the ground at low speed (i.e. as long as air resistance is negligible in comparison to weight). Since all objects fall at the same rate in the absence of other forces, objects and people will experience weightlessness in these situations. Flying in an aircraft: there is also an additional force of lift. Standing on the ground: the gravitational force is counteracted by the normal force from the ground. Descending to the Earth using a parachute, which balances the force of gravity with an aerodynamic drag force (and with some parachutes, an additional lift force). The example of a falling skydiver who has not yet deployed a parachute is not considered free fall from a physics perspective, since he experiences a drag force that equals his weight once he has achieved terminal velocity (see below). However, the term "free fall skydiving" is commonly used to describe this case in everyday speech, and in the skydiving community. It is not clear, though, whether the more recent sport of wingsuit flying fits under the definition of free fall skydiving. , where h is the height and g is the free-fall acceleration due to gravity. Near the surface of the Earth, an object in free fall in a vacuum will accelerate at approximately 9.8 m/s2, independent of its mass. With air resistance acting on an object that has been dropped, the object will eventually reach a terminal velocity, which is around 53 m/s (195 km/h or 122 mph) for a human skydiver. The terminal velocity depends on many factors including mass, drag coefficient, and relative surface area and will only be achieved if the fall is from sufficient altitude. A typical skydiver in a spread-eagle position will reach terminal velocity after about 12 seconds, during which time he will have fallen around 450 m (1,500 ft). This is the "textbook" case of the vertical motion of an object falling a small distance close to the surface of a planet. It is a good approximation in air as long as the force of gravity on the object is much greater than the force of air resistance, or equivalently the object's velocity is always much less than the terminal velocity (see below). is the initial velocity (m/s). is the vertical velocity with respect to time (m/s). is the initial altitude (m). is the altitude with respect to time (m). is the acceleration due to gravity (9.81 m/s2 near the surface of the earth). Acceleration of a small meteoroid when entering the Earth's atmosphere at different initial velocities. is the drag coefficient, assumed to be constant although in general it will depend on the Reynolds number. Using the figure of 56 m/s for the terminal velocity of a human, one finds that after 10 seconds he will have fallen 348 metres and attained 94% of terminal velocity, and after 12 seconds he will have fallen 455 metres and will have attained 97% of terminal velocity. However, when the air density cannot be assumed to be constant, such as for objects or skydivers falling from high altitude, the equation of motion becomes much more difficult to solve analytically and a numerical simulation of the motion is usually necessary. The figure shows the forces acting on meteoroids falling through the Earth's upper atmosphere. HALO jumps, including Joe Kittinger's and Felix Baumgartner's record jumps (see below), and the planned Le Grand Saut, also belong in this category. It can be said that two objects in space orbiting each other in the absence of other forces are in free fall around each other, e.g. that the Moon or an artificial satellite "falls around" the Earth, or a planet "falls around" the Sun. Assuming spherical objects means that the equation of motion is governed by Newton's Law of Universal Gravitation, with solutions to the gravitational two-body problem being elliptic orbits obeying Kepler's laws of planetary motion. This connection between falling objects close to the Earth and orbiting objects is best illustrated by the thought experiment, Newton's cannonball. μ = G(m1 + m2) is the standard gravitational parameter. Substituting y = 0 we get the free-fall time. In general relativity, an object in free fall is subject to no force and is an inertial body moving along a geodesic. Far away from any sources of space-time curvature, where spacetime is flat, the Newtonian theory of free fall agrees with general relativity. Otherwise the two disagree; e.g., only general relativity can account for the precession of orbits, the orbital decay or inspiral of compact binaries due to gravitational waves, and the relativity of direction (geodetic precession and frame dragging). The experimental observation that all objects in free fall accelerate at the same rate, as noted by Galileo and then embodied in Newton's theory as the equality of gravitational and inertial masses, and later confirmed to high accuracy by modern forms of the Eötvös experiment, is the basis of the equivalence principle, from which basis Einstein's theory of general relativity initially took off. Joseph Kittinger starting his record-breaking skydive in 1960. His record was broken only in 2012. In 1914, while doing demonstrations for the U.S. Army, a parachute pioneer named Tiny Broadwick deployed her chute manually, thus becoming the first person to jump free-fall. According to the Guinness Book of Records, Eugene Andreev (USSR) holds the official FAI record for the longest free-fall parachute jump after falling for 24,500 metres (80,400 ft) from an altitude of 25,458 metres (83,524 ft) near the city of Saratov, Russia, on November 1, 1962. Although later on jumpers would ascend higher altitudes, Andreev's record was set without the use of a drogue chute during the jump and therefore remains the longest genuine free fall record. During the late 1950s, Captain Joseph Kittinger of the United States was assigned to the Aerospace Medical Research Laboratories at Wright-Patterson AFB in Dayton, Ohio. For Project Excelsior (meaning "ever upward", a name given to the project by Colonel John Stapp), as part of research into high altitude bailout, he made a series of three parachute jumps wearing a pressurized suit, from a helium balloon with an open gondola. The first, from 76,400 feet (23,290 m) in November 1959 was a near tragedy when an equipment malfunction caused him to lose consciousness, but the automatic parachute saved him (he went into a flat spin at a rotational velocity of 120 rpm; the g-force at his extremities was calculated to be over 22 times that of gravity, setting another record). Three weeks later he jumped again from 74,700 feet (22,770 m). For that return jump Kittinger was awarded the A. Leo Stevens parachute medal. On August 16, 1960 he made the final jump from the Excelsior III at 102,800 feet (31,330 m). Towing a small drogue chute for stabilization, he fell for 4 minutes and 36 seconds reaching a maximum speed of 614 mph (988 km/h) before opening his parachute at 14,000 feet (4,270 m). Pressurization for his right glove malfunctioned during the ascent, and his right hand swelled to twice its normal size. He set records for highest balloon ascent, highest parachute jump, longest drogue-fall (4 min), and fastest speed by a human through the atmosphere. The jumps were made in a "rocking-chair" position, descending on his back, rather than the usual arch familiar to skydivers, because he was wearing a 60-pound (27 kg) "kit" on his behind and his pressure suit naturally formed that shape when inflated, a shape appropriate for sitting in an airplane cockpit. For the series of jumps, Kittinger was decorated with an oak leaf cluster to his Distinguished Flying Cross and awarded the Harmon Trophy by President Dwight Eisenhower. In 2012, the Red Bull Stratos mission took place. On October 14, 2012, Felix Baumgartner broke the records previously set by Kittinger for the highest free fall, the highest manned helium balloon flight, and the fastest free fall; he jumped from 128,100 feet (39,045 m), reaching 833.9 mph (1342 km/h) - Mach 1.24. Kittinger was a member of the mission control and helped design the capsule and suit that Baumgartner ascended and jumped in. On October 24, 2014, Alan Eustace broke the record previously set by Baumgartner for the highest free fall. He jumped from a height of 135,908 feet (41,425 m). A falling person at low altitude will reach terminal velocity of 190 km/h (120 mph) after about 12 seconds, falling some 450 m (1,500 ft) in that time. The person will then maintain this speed without falling any faster. Terminal velocity at higher altitudes is greater due to the thinner atmosphere and consequent lower air resistance; free-fallers from high altitudes, including Kittinger, Baumgartner and Eustace discussed in this article, fell faster at higher altitudes. The severity of injury increases with the height of a free fall, but also depends on body and surface features and the manner that the body impacts on to the surface. The chance of surviving increases if landing on a soft surface, such as snow. Overall, the height at which 50% of children die from a fall is between four and five storey heights above the ground. JAT stewardess Vesna Vulović survived a fall of 10,000 metres (33,000 ft) on January 26, 1972 when she was aboard JAT Flight 367. The plane was brought down by explosives over Srbská Kamenice in the former Czechoslovakia (now the Czech Republic). The Serbian stewardess suffered a broken skull, three broken vertebrae (one crushed completely), and was in a coma for 27 days. In an interview, she commented that, according to the man who found her, "…I was in the middle part of the plane. I was found with my head down and my colleague on top of me. One part of my body with my leg was in the plane and my head was out of the plane. A catering trolley was pinned against my spine and kept me in the plane. The man who found me, says I was very lucky. He was in the German Army as a medic during World War Two. He knew how to treat me at the site of the accident." In World War II there were several reports of military aircrew surviving long falls from severely damaged aircraft: Flight Sergeant Nicholas Alkemade jumped at 5,500 metres (18,000 ft) without a parachute and survived as he hit pine trees and soft snow. He suffered a sprained leg. Staff Sergeant Alan Magee exited his aircraft at 6,700 metres (22,000 ft) without a parachute and survived as he landed on the glass roof of a train station. Lieutenant Ivan Chisov bailed out at 7,000 metres (23,000 ft). While he had a parachute, his plan was to delay opening it as he had been in the midst of an air-battle and was concerned about getting shot while hanging below the parachute. He lost consciousness due to lack of oxygen and hit a snow-covered slope while still unconscious. While he suffered severe injuries, he was able to fly again in three months. It was reported that two of the victims of the Lockerbie bombing survived for a brief period after hitting the ground (with the forward nose section fuselage in freefall mode), but died from their injuries before help arrived. Juliane Koepcke survived a long free fall resulting from the December 24, 1971, crash of LANSA Flight 508 (a LANSA Lockheed Electra OB-R-941 commercial airliner) in the Peruvian rainforest. The airplane was struck by lightning during a severe thunderstorm and exploded in mid air, disintegrating 3.2 km (2 mi) up. Köpcke, who was 17 years old at the time, fell to earth still strapped into her seat. The German Peruvian teenager survived the fall with only a broken collarbone, a gash to her right arm, and her right eye swollen shut. Parachute jumper and stuntman Luke Aikins successfully jumped without a parachute from about 7,600 metres (25,000 ft) into a 930-square-metre (10,000 sq ft) net in California, US, on 30 July 2016. ^ a b "Free fall graph" (PDF). Green Harbor Publications. 2010. Retrieved 14 March 2016. ^ An analysis of his and similar jumps is given in Mohazzabi, P.; Shea, J. (1996). "High altitude free fall" (PDF). American Journal of Physics. 64 (10): 1242. Bibcode:1996AmJPh..64.1242M. doi:10.1119/1.18386. ^ Foong, S K (2008). "From Moon-fall to motions under inverse square laws". European Journal of Physics. 29 (5): 987. Bibcode:2008EJPh...29..987F. doi:10.1088/0143-0807/29/5/012. ^ Mungan, Carl E. (2009). "Radial Motion of Two Mutually Attracting Particles". The Physics Teacher. 47 (8): 502. Bibcode:2009PhTea..47..502M. doi:10.1119/1.3246467. ^ Data of the stratospheric balloon launched on 8/16/1960 For EXCELSIOR III. Stratocat.com.ar. Retrieved on 2016-07-31. ^ "Speed of a Skydiver (Terminal Velocity)". Hyper Text Book. ^ Higgins, Matt (May 24, 2008). "20-Year Journey for 15-Minute Fall". The New York Times. Retrieved May 2, 2010. ^ Joseph W. Kittinger – USAF Museum Gathering of Eagles. Web.archive.org. Retrieved on 2016-07-31. ^ Markoff, John (24 October 2014). "Parachutist's Record Fall: Over 25 Miles in 15 Minutes". The New York Times. Retrieved 25 October 2014. ^ Notes and figures on free fall. Greenharbor.com. Retrieved on 2016-07-31. ^ a b Atanasijević, T; Nikolić, S; Djokić, V (2004). "Level of total injury severity as a possible parameter for evaluation of height in fatal falls". Srpski arhiv za celokupno lekarstvo. 132 (3–4): 96–8. doi:10.2298/sarh0404096a. PMID 15307311. ^ Barlow, B.; Niemirska, M.; Gandhi, R. P.; Leblanc, W. (1983). "Ten years of experience with falls from a height in children". Journal of Pediatric Surgery. 18 (4): 509–511. doi:10.1016/S0022-3468(83)80210-3. PMID 6620098. ^ "Survivor still haunted by 1971 air crash". CNN.com. July 2, 2009. Retrieved 2009-07-02. ^ "Jumper survives 6,000ft free fall". BBC News. May 18, 2009. Retrieved January 4, 2010. ^ "US skydiver jumps without parachute into net from 25,000ft". BBC News. 31 July 2016. Retrieved 31 July 2016. Unplanned Freefall? A slightly tongue-in-cheek look at surviving free-fall without a parachute. H.S. Free fall lesson with videos and interactive flash animations. Wikimedia Commons has media related to Free fall.